Clinch Mountain Music Fest is gearing up for its eighth-annual celebration of mountain music in Scott County, Virginia, on Saturday, June 8, 2013. This year’s festival will be held at the Carter Family Fold in Hiltons. The goal of Clinch Mountain Music Fest is to preserve and perpetuate the heritage of the Appalachian region through its music. Featuring mountain and bluegrass music of the region, Clinch Mountain Music Fest is a fan favorite. Abingdon, Virginia -- he Crooked Road: Virginia’s Heritage Music Trail proudly presents a Youth Music Performance Series concert on Thursday, April 11th from 6:00 to 7:30 p.m. at Heartwood: Southwest Virginia’s Artisan Gateway in Abingdon, Virginia. The special concert, co-hosted by WVTF Radio as part of Public Radio Music Month and the Town of Abingdon, will feature the Blackberries. Hiltons, VA -- The Bluegrass Brothers are a high energy bluegrass band. Playing traditional style bluegrass, they grew up in bluegrass music families in Virginia. One of the finest bluegrass shows in the country, they perform from coast to coast in a soulful, heartfelt manner. In high demand on the festival circuit, they’re on the road more than they are home. SPBGMA named them instrumental group of the year in 2010. Members of the band are Victor Dowdy, Steven Dowdy, Kevin Prater, Chris Hart, and Cason Ogden. 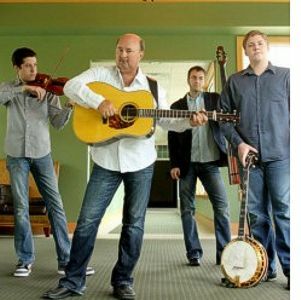 Saturday, April 13th, 2013 the Carter Family Fold in Hiltons, Virginia, will present a concert by theThe Bluegrass Brothers. Visit www.CarterFamilyFold.org for more details. Abingdon, VA -- When someone speaks of a “Phoenix rising” it is usually in reference to good things that rise from the ashes like the fabled bird of Greek mythology. In the case of the McGuire Family Campgrounds in Dublin, this is an image that is literally true. When Mike and Sharon McGuire and their son Jason and daughter Jennifer found the campground in 1995, its one building, a convenience store, was mostly a burned out building. Now almost 18 years and a lot of hard work later, McGuire’s has a busy RV campground, a restaurant, and the Hillbilly Opry, a wonderful Saturday night music experience that is the newest Affiliated Venue of The Crooked Road. Abingdon, Virginia – The Crooked Road: Virginia’s Heritage Music Trail proudly presents a Youth Music Performance Series concert on Thursday, April 11th from 6:00 to 7:30 p.m. at Heartwood: Southwest Virginia’s Artisan Gateway in Abingdon, Virginia. The special concert, co-hosted by WVTF Radio as part of Public Radio Music Month and the Town of Abingdon, will feature the Blackberries. Abingdon, VA -- Hurley, Virginia is in Buchanan County, an area rich in coal resources. It is also rich in traditional music, including Gospel, Old-time and Bluegrass. Twice a week on Tuesday and Thursday evenings, musicians of the area congregate for the Verner Blankenship Park Music Jam to share the music that has been handed down for generations in this mountainous region. Heartwood, VA -- Blacksburg is well-known as a college town, but it is also the location of one of the most vibrant old time and bluegrass music scenes in The Crooked Road region. This is thanks in part to their Market Square Jam, which creates a bustling scene for traditional music lovers and folks who just like a lively downtown atmosphere. At 7:00 pm on Thursday, March 28, 2013, the Blacksburg Market Square Jam from Montgomery County will be the featured Venue Showcase at Heartwood. Admission is free but donations will be accepted for the series performances. The Crooked Road: Virginia’s Heritage Music Trail music series at Heartwood in Abingdon showcases communities of the region through their traditional music venues and their youth music. At 7:00 pm on Thursday, January 24, 2013 the Allen Hicks Jam from Nickelsville, Virginia will be the featured Venue Showcase at Heartwood. Instrument makers’ shops are a popular hangout for local musicians and a natural place for jamming. Abingdon, VA -- The D’Addario Foundation recently announced that The Crooked Road: Virginia’s Heritage Music Trail will receive a $2,000 grant to support traditional music education in Southwest Virginia. The Crooked Road’s Traditional Music Education Program Phase 2, builds upon findings from the program rollout—generating more after-school programs, school assembly programs, and performance opportunities for the region’s youth while strengthening the educational foundation through curricular material distribution, teacher training workshops, and a teacher re-certification course serving a 19-county region of rural Southwest Virginia. The grant will assist with instructor contracts for four new after-school Crooked Road/JAM traditional music programs: FloydJAMS, WiseJAMS – Coeburn/St. Paul, WiseJAMS – Big Stone Gap/Appalachia , and Dickenson County JAMS.